» Report: Peyton Manning Picks Denver! Farewell, Tebow? HUGE Bad Quarterback League news, you guys. Also huge news in like, life and the NFL and stuff. Peyton Manning will become the next quarterback of the Denver Broncos, barring a snag during intensified contract negotiations that have commenced under the instruction of the four-time MVP to his agent Tom Condon, according to multiple sources. Once the Manning deal becomes official, Denver will try to trade Tim Tebow, according to sources. 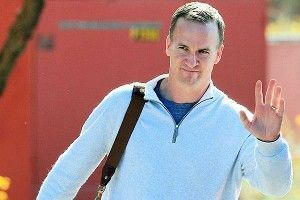 Manning instructed Condon to negotiate the finite details of a contract that would conclude with him joining the Broncos after a frenzied but focused process that began when the Indianapolis Colts released him March 7.